Passengers Movie Review - Are You Screening? 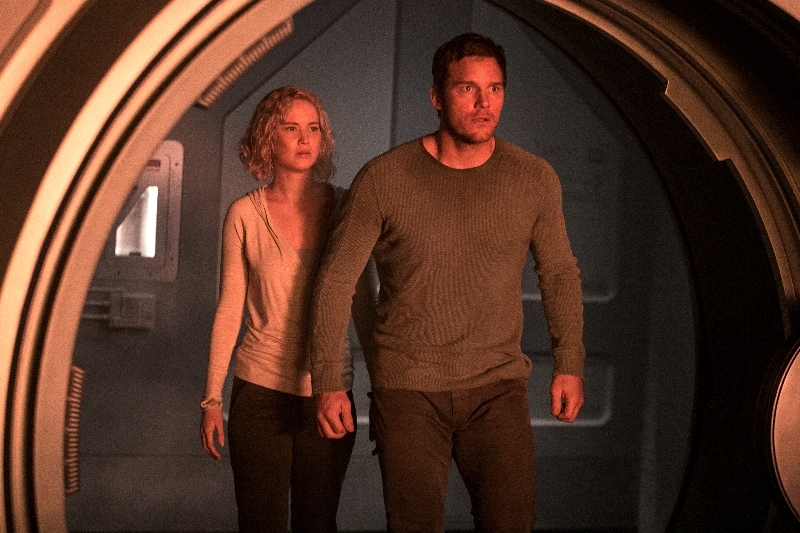 Even with two of the biggest names in movies right now, Chris Pratt and Jennifer Lawrence, it’s hard to sell people on a sci-fi film that, for all intents and purposes, has no one else in it. Passengers is a film that, like a lot of sci-fi, hopes to offer up situations that no one could ever go through in order to force us to think about how we lead our lives. Jim Preston (Pratt) is aboard a spaceship that will be traveling for over 100 years to get to a colony planet. He’s on board with over 5,000 other people, and they’ll be sleeping throughout the journey, but a malfunction wakes Jim up with 90 years left to go. Now, he has to face the fact that he’s going to die before he gets anywhere, and he’s going to do it alone. After a year in solitary, with only a robot bartender (Michael Sheen) to talk to, Jim stumbles upon a woman he finds fascinating, and the means to wake her up. Said woman, Aurora (Lawrence), is a writer who planned to travel to the colony for a short time and then return to tell the story. Jim now finds himself in an ethical dilemma for the ages, and he tortures himself for a while before choosing to doom her in order to save his sanity. It turns out to have been a good idea, if you follow some ethical road far enough, because the system failure that woke Jim eventually wreaks havoc across the ship, and everyone is lost unless someone figures out what to do. It’s never a good idea to reference other criticism within a review, but Passengers has been slammed over a theory of misogyny and/or a sexist mindset behind the plot, and it is not only absurd, it is to misunderstand virtually everything that happens. © 2016 Columbia Pictures Industries, Inc. All Rights Reserved. Like any fairy tale (and this one is akin to the harsh nature of the original Grimm works), the story is multi-layered metaphor wrapped in an entertaining package, with pretty stars and slick action… or something. Sure, Jim kills Aurora, in a sense, but there are whole worlds in that decision. Sure, Jim kills Aurora, in a sense, but there are whole worlds in that decision. It’s a very precise moral quandary that Jim finds himself in, and his action isn’t as straightforward it seems. But, the act itself is only the film’s story at its most boring level. Jim and Aurora do fall in love, and then there is a lot more on offer. People in love forgive a lot of things, and the film isn’t about answering things in a certain way, but opening the door to a lot of questions. Do we judge our lovers’ actions differently? How bad is the act exactly? If he hadn’t done it, I would have missed out on loving him… is that something I can find a way to factor into the idea that he basically killed me? It goes even further too. Aurora had a plan for her life, and a perfectly realizable goal of returning to Earth in 200 years to write the greatest story humanity had ever known. Jim stole that life from her. But, how different is that from the normal life-stealing that is falling love and having a life together with someone? If nothing had gone wrong, and they had simply met on the colony planet and she had chosen to stay because she was in love, would that be all that different? If it is, why? There’s obviously a very direct sense in which Jim “did this to her,” but aren’t we always “doing it to each other?” Or, aiming to anyway? It may be to wax rather “Zen Mysticism” at the idea, but there is something of killing the other person at the heart attempting to love them, or be loved by them. Director Moren Tyldum (The Imitation Game) proves again that he knows how to get the most out of a scene, and can build conversations into their own worlds. There is hardly a moment that feels out of place, and the actors all pull as much character as possible into every breath. It only goes slightly wrong at the end, because there is a far better ending available and it would be such an easy fix. The film ultiimately reminds much of other films that use space as a vehicle, like Moon and Solaris, and Passengers is just like those insofar as making a mistake in thinking it is saying anything at all. It’s just wondering things at you, and taking you along for the ride. The Space Koan genre went a long time without a lot of members, but things are picking up and this one is as fun as it is philosophical, and as daring as it is touching and hopeful.